Dr Heath King – USA’s foremost futurist sage psycho-analyst – discussed with StClair issues ranging from Telepathy, Human Emanations & TimeTravel to world affairs 2020 – in context of joint visit in ancient Greek site & his exceptional journey in exile – meeting Jean Paul Sartre & Doris Lessing, HW Cassirer & RD Laing. – filmed on location in Empuries Costa Brava [Empurion] on shores of Mediterranean where Salvador Dali was able to – through his paintings – visually explain what is normally invisible. 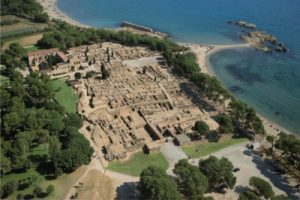 This visit to the ancient site of Empuries going as far back as Phoenicians & probably further to Atlantis with Dr King considering Salvador Dali’s love of the area & as he questions the illusion of linear time he sees reality melting into infinity. …………………………………………………………………… at The End of The RainBow. arranged all permissions to film on location.